The Clothesline Sale is running this weekend, and I had a chance to browse the sale during the volunteer/consignor shopping hours this morning. “Browse,” however, is not possible with a grumpy toddler, so I did the best I could. 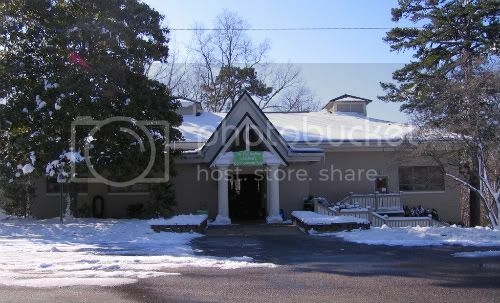 The sale location is a new, bigger venue – the Bon Air Community Center, 8725 Quaker Lane (Turn onto Rockaway Rd from Buford and you’ll see it). I haven’t been previously, but I can’t imagine how it would fit in any smaller space. There was enough room to move around, but just enough. Everything was well-organized. In the clothes section, I focused my energies on the long toddler boys rack. Prices varied widely, but most items were in the $1-$4 range. Each consignor’s pieces were still mostly grouped together, and not surprisingly, some folks price higher than others. So I would find patches of $1-$2 shirts, then jump up to $4-$5 down the row with a different seller. The clothes were predominantly shorts/tees, with some pants thrown in. I picked up a $1.50 polo and $2 khakis (both GAP), $1 Gymboree shorts and $2 Old Navy overalls. All were in great condition. I didn’t get nearly enough time to browse the book & game section. My purchases were Pat the Bunny and Time for Bed ($.50), and Barnyard Dance by Sandra Boynton for $1.50. I was also tempted by a number of wooden puzzles. My husband has placed an embargo on toys entering our house, so I skimmed that area as well. As you can see from the photo, there’s basically every noisy and colorful device you can think of. 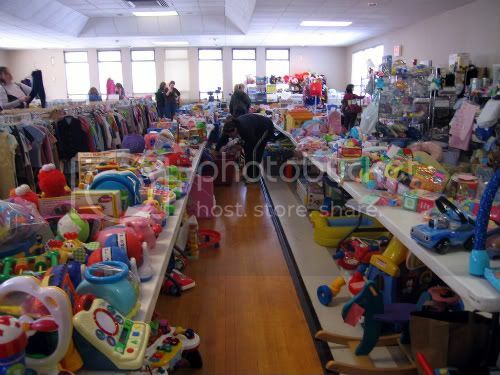 I saw a number of activity tables and ride-on toys for $8-$10. 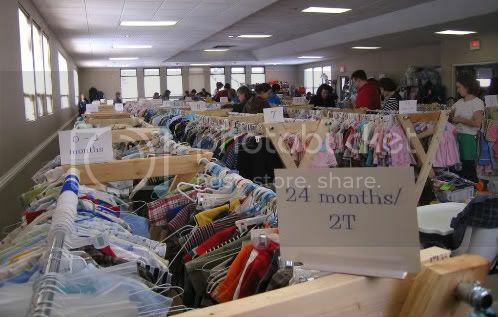 New and expecting moms owe it to their wallets to visit at least one of the spring consignment sales. Baby gear is represented in abundance, as evidenced by the above pic! 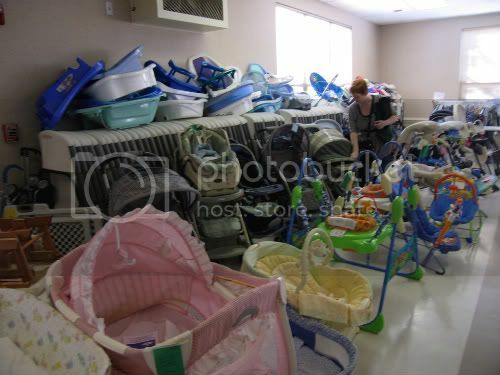 Even if you don’t want a second-hand stroller, there are lots of great deals on smaller items, from bouncy seats for $5 and jumperoos for $25, to stacks of baby baths and some Snugli-style carriers. The only negative of the experience was a twenty-five minute wait in line to pay when my son was very ready to leave. Between adding up prices and removing tags, checking out is a time-consuming process. If you’re planning to shop this sale (or any consignment sale), remember to bring bags or laundry baskets to carry your items while you shop. Don’t bring strollers – they aren’t allowed because there is NO room for them. And bring enough cash or your checkbook (At Clothesline, credit cards can be used on purchases over $50). Visit http://www.theclothesline.biz/ for sale hours, including the half-off sale on Satuday and 75% off sale Sunday. Updates for Fall 09: Clothesline is growing! There will be a second sale in Mechanicsville at Hanover Village Shopping Center. The Bon Air location will be expanded into a downstairs room as well. Plus both sales will feature barcoded tags, hopefully preventing the long line wait I experienced.